I’m very lucky to have some fabulous online friends, some of whom are generous to share their stash when I make cheeky comments on their IG pics. Kim was cutting up some 2 1/2″ squares for a project, when I spied she was chopping up some precious Heather Ross. I suggested she could just keep on chopping for me too, and she did! 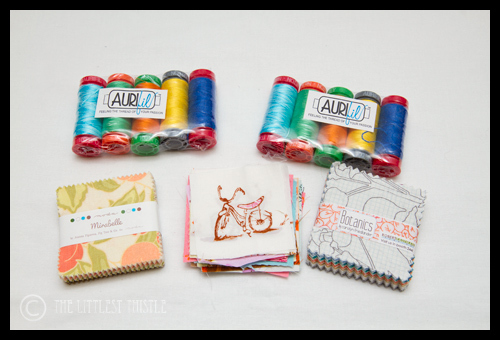 Not only did she send me a pile of HR loveliness, she also threw in a couple of mini packs that she grabbed at Market, and a couple of packs of Aurifil, in my favourite bright colours. Thank you so much Kim! 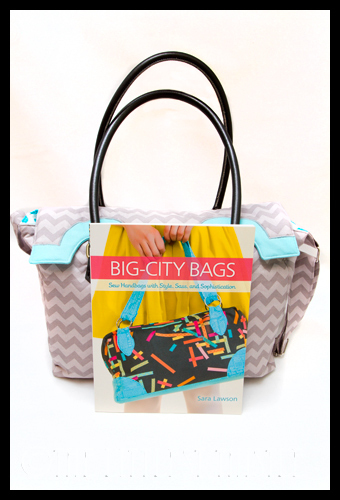 Also in the post on Saturday was my bag that I pattern tested for Sara’s new book, along with my own autographed copy – I’d had a PDF when I did the review in advance of the release, so it was nice to get a paper version in my hands. Thanks Sara! It's like Christmas has come early!! Your mail this week is tres exciting. Lucky you! that is what I call a real friend. I love the little fussy cut bicycle, soo cute. sew a long, not quite ready for the stress of a bee yet! Lovely mail. I better check out that quilt-along! The goodness just keeps on coming. Gorgeous happy mail! I wonder when the quilt book market will get saturated?! What good friends you have!!! !